Muestra el total de Acciones en Circulación por acción al último día hábil de cada mes. Shows the total number of outstanding shares by issuer, as of the last weekday of the month. Data is sent vía e-mail, at the end of each month within the first 5 days of each month. 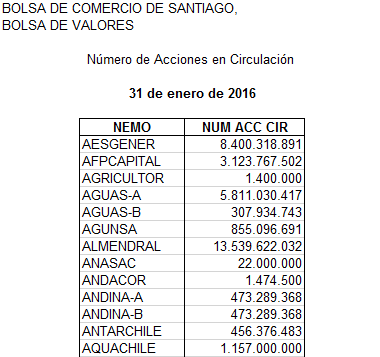 Copyright © 2019 Bolsa de Comercio de Santiago. Todos los derechos reservados.